LRET tracks twice the monthly return of the MSCI US Investable Market Real Estate 25/50 Index. However, the high expense ratio eats into LRET's returns in the long run. One possible alternative, the 2x leveraged real estate fund, URE, is mentioned. This article was first released to subscribers one month ago. 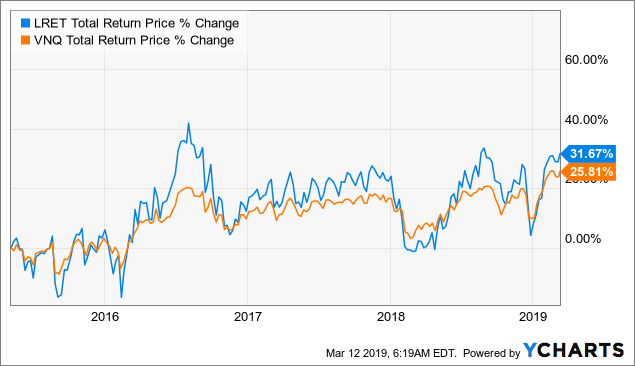 The 8%-yielding ETRACS Monthly Pay 2xLeveraged MSCI US REIT Index ETN (LRET), a 2x-leveraged REIT ETN, may not be a good long-term holding due to its high fees. LRET was incepted on May 5, 2015, so it has been around for nearly four years, although it hasn't had great success in accumulating AUM, with only about $6 million in assets. LRET tracks twice the monthly return of the MSCI US Investable Market Real Estate 25/50 Index. During this time, it has provided a total return of +31.67% to investors, vs. +25.81% for the unlevered ETF, the Vanguard REIT ETF (VNQ), which tracks the same index as LRET. At first glance, this seems like a tremendous failure for the 2x ETN - shouldn't it have returned over +50%, or twice of VNQ's return? To investigate this issue, I plotted the monthly return of LRET vs. the monthly return of VNQ since the inception of LRET. 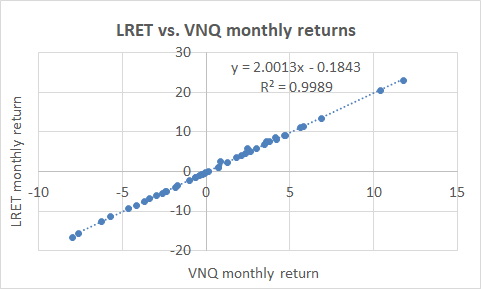 As the chart below shows, there's an extremely strong correlation (R^2 = 0.9989) with a gradient that is nearly exactly 2 (2.0013 to be precise), meaning that on a month-to-month basis, LRET has more or less returned twice of VNQ, as it is meant to. However, the devilish detail is in the y-intercept of -0.1843. While this number seems small, it actually represents the monthly return loss of LRET vs. 2x VNQ's return. In other words, LRET does return twice of VNQ each month, minus 0.18%. This monthly -0.18% drag, or -2.2% per year, actually has a major effect on returns in the long run. Where does this drag come from? The answer is in the expense ratio. LRET charges a very high baseline expense ratio of 1.65%. Tack on the three-month LIBOR rate, which has varied between a low of 0.3% when LRET was first incepted to a high of over 2.8% late last year, and we can easily see where the -2.2% per year drag comes from. In comparison, VNQ has a dirt-cheap expense ratio of 0.12%. The second source of underperformance of LRET comes from the phenomenon of "leverage decay" (also known as "beta slippage"). 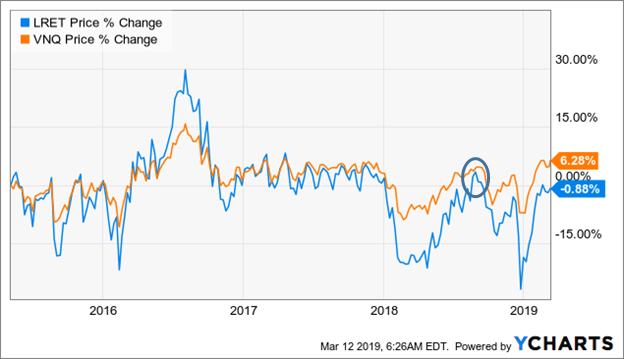 When the underlying index goes up and down but does not trend strongly in either directly, the leveraged fund will suffer leverage decay (see "Has Monthly Resetting Helped Or Hurt The ETRACS 2x Leveraged ETNs?" for more information). 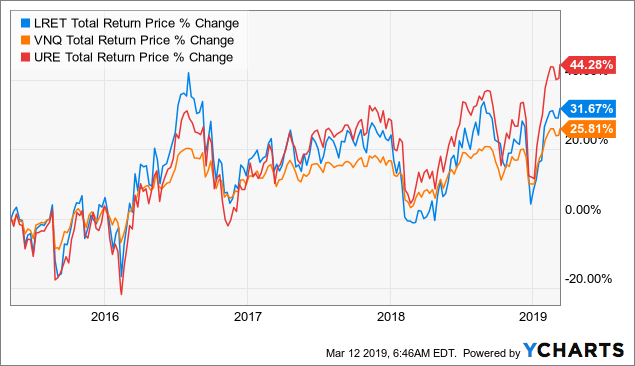 Here, we see that since the inception of LRET, the benchmark VNQ has traded mostly sideways, ending up with a price-only change of +6.28% after four years. Assuming that LRET suffered a constant drag of -2.2% per year since inception due to the expenses, there's still a ~4% overall differential to VNQ's hypothetical 2x performance which may be attributable to leverage decay. This effect is most pronounced when the underlying index is volatile. As can be seen from the chart below, LRET and VNQ price-only returns were still very close to each other during middle-to-late 2018 (as indicated in the chart). However, after several very volatile months to close the year (including one of the sharpest V-shaped rebounds in recent history), the leverage decay gap becomes apparent. Overall, I would say that LRET is a poor choice for long-term leveraged REIT exposure. This is mainly due to its very high expense ratio - with a current LIBOR of 2.6%, you'd be paying over 4% per year in expenses for LRET! In fact, with certain brokers such as Interactive Brokers, you could even get a lower effective expense ratio by margining VNQ on your own than buying LRET (see Margin Or ETRACS 2x ETNs For Leveraged Exposure?). One alternative is for 2x-leveraged real estate exposure is ProShares Ultra Real Estate ETF (URE). This ETF tracks a different index, the Dow Jones U.S. Real Estate Index, however a quick glance reveals that they have identical top holdings. The big advantage of URE over LRET is its much lower expense ratio of 0.95%* - it appears that URE maintains its leverage using derivatives rather than margin - so it does not charge an interest expense on top of management expenses like LRET does. (*0.95% is with a contractual fee waiver through September 30, 2019. The gross expense ratio is 1.03%, still much lower than LRET's 4%+ expenses). The effect of the lower fees can be clearly seen in the long-term chart of the three funds below. However, a drawback of URE is that it isn't designed to be an income vehicle, and sports a ttm yield of only 1.22%. Moreover, its leverage resets daily rather than monthly for LRET, which can increase leverage decay during periods with high day-to-day volatility. Despite its 8% yield, LRET is a poor choice for the buy-and-hold investor due to its high fees which greatly eats into returns over the long run. One possible alternative 2x leveraged real estate ETN is URE, but its 1% yield may not be too exciting for income investors. For more information about the ETRACS 2x ETN line-up, see our latest, "ETRACS 2x Leveraged ETN Snapshot."